Global load monitoring system market expected to reach USD 3.36 billion by 2025, at a CAGR of 4.1% between 2019 and 2025. The load monitoring system measures and displays weights of different objects to warn the workers in case of weight overload. The report covers a forecast and an analysis of the load monitoring system market on a global and regional level. The study provides historical information for 2016, 2017, and 2018 with a forecast from 2019 to 2025 based on revenue (USD Billion). The study covers the key drivers and restraints of the load monitoring system market along with their market impact over the forecast period. Furthermore, the study also includes the opportunities accessible within the load monitoring system market on a global level. In order to offer the users of this report, a comprehensive view of the load monitoring system market, we have enclosed a detailed value chain analysis. To know the competitive landscape within the market, an analysis of Porter’s Five Forces model for the load monitoring system market has additionally been enclosed within the study. The study includes a market attractiveness analysis, wherein all the segments are benchmarked based on their market size, growth rate, and general attractiveness. The study also includes the market share of the key participants operating in the load monitoring system market across the globe. Additionally, the report covered the strategic development together with acquisitions & mergers, agreements, partnerships, collaborations, and joint ventures, and regional growth of key players within the market on a regional basis. The study provides a crucial view of the load monitoring system market based on the offering, type, application, and region. All the segments have been analyzed based on present and future trends and the market is estimated from 2019 to 2025. By offering, the global load monitoring system includes load cell, indicator and controller, and data logging software. Furthermore, the load cell is divided into single beam load cell, s-type load cell, dual shear load cell, bending beam load cell, and others. By type, the market includes analog load monitoring system and digital load monitoring system. By application, the market includes automotive, marine, construction, energy, aerospace, healthcare, and others. The regional classification includes Europe, North America, Latin America, Asia Pacific, and the Middle East and Africa. 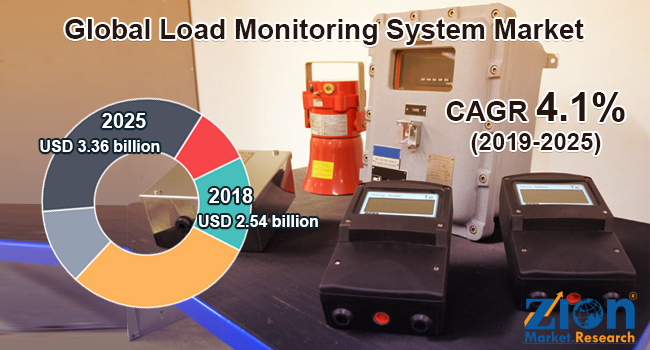 Some key players of the global load monitoring system market include Vishay Precision Group, Straightpoint, Spectris, LCM Systems, PreciaMolen, Flintec, Wirop Industrial, Mettler Toledo, Euroload, Mantracourt Electronics, Eilersen Electric Digital Systems, and Futek Advanced Sensor Technology, among others.